Explore the home of Scottish Royal history in this Holyrood Palace 360 Tour. You can look around The Great Stair, the Morning Drawing Room and the King’s Bedchamber in high resolution. Thus you can zoom in and see the detail on the tapestries and other artworks. Info points provide additional detail about the items in the collection. As visitors arrive and make their way up the Great Stair, they might well be drawn to the fine tapestries and paintings that adorn the walls. 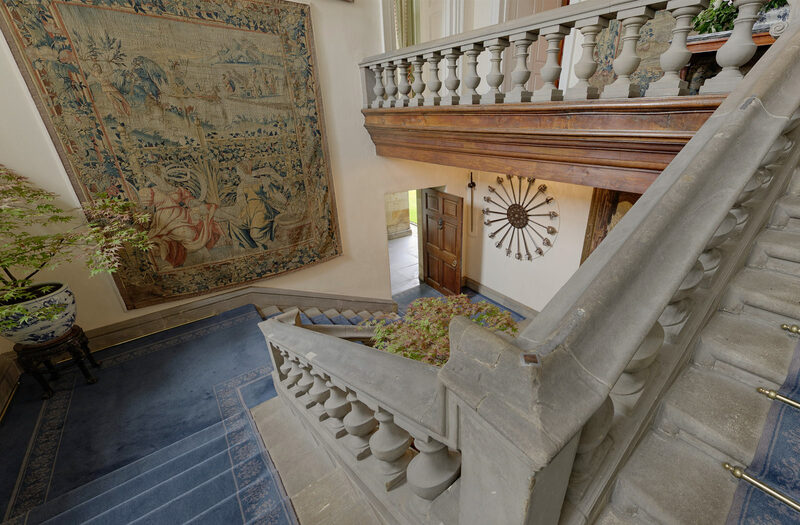 The beauty of this 360 tour is that it allows online viewers the luxury of looking up. And so in looking up they can zoom in to view the magnificent plasterwork ceiling. You can have a leisurely look around the Morning Drawing Room (also known as the Privy Chamber). A wood-panelled chamber hung with tapestries depicting tales from the myths. These tapestries were bought by Charles II in the 17th century. The info points in the tour give viewers information on the artefacts around the room, including gifts to Queen Victoria. The King’s Bedchamber, created in the 17th century again features a plasterwork ceiling that’s not to be missed. Look up in the virtual tour and you’ll see an intricate, incredible ceiling. Most noteworthy is the centrepiece – a painting by Jacob de Wet. The trompe l’oeil effect at the edges give you the impression that you’re peering into the heavens above. Look at how the animals’ paws are seemingly poised over the edge! Please click ‘Launch Project’ to view the Palace of Holyroodhouse 360 virtual tour.